Fourteen-year-old Charlie Han, aka “Tiny Charlie,” aka “the Chinese midget,” is used to being bully bait, the lethal combination of his oddly small stature and klutziness making him a shoe-in for the worst junior high has to offer. It doesn’t help that his mother is overprotective to the point of smothering or that he’s unsure whether “Sinus” Sedgley is his best friend or just an equally bullied buddy by default. All Charlie wants to do is find his “thing,” that special something that will finally make the kids at school see him, truly, for the first time. A newfound love of skateboarding may just be that thing, and, together with a real friend, it offers him a chance to soar. Charlie’s narration is both laugh-out-loud funny and heartbreaking. He may be small, but his determination to change his lot in life is enormous. Though a secondary plotline meant to explain his mother’s extreme overprotectiveness is slightly difficult to swallow, the rest of the story more than makes up for it. 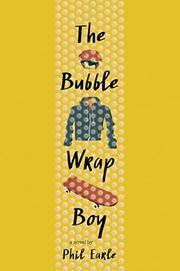 In the fast-growing bullying genre, Charlie’s story stands out. This isn’t a kid who will do anything to join the cool clique. This is a story about staying true to yourself and following your passion.